John Kerry, then a U.S. senator, meets with Afghan President Hamid Karzai at the presidential palace in Kabul in October 2009. 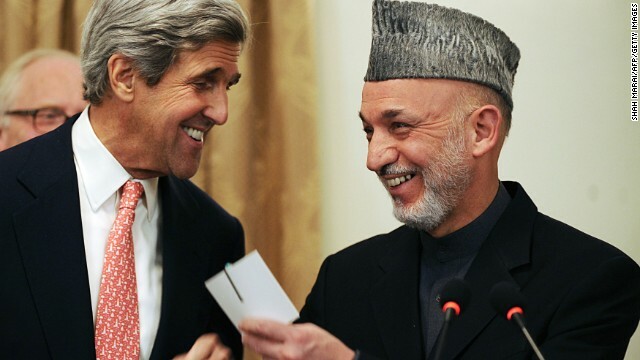 U.S. Secretary of State John Kerry made a previously unannounced stop in Afghanistan for a meeting with Afghan President Hamid Karzai on Monday, the day that a U.S.-run prison that bred tension between the nations was handed over to the Afghans. Kerry landed in Kabul on Monday afternoon and was expected to meet with Karzai at the presidential palace later in the day. Kerry's visit comes on the day that the United States handed over control of a U.S.-run prison near Bagram Air Base to Afghan authorities. The detention facility was a sticking point between U.S. and Afghan officials. The visit also comes amid other tensions between Karzai and the NATO-led coalition forces that escalated after a bomb blast in Kabul this month that killed nine people. Karzai said afterward that there are "ongoing daily talks between the Taliban, Americans and foreigners in Europe and in the Gulf states." Exactly @ sheila! We need to stop ALL foreign aid NOW! We provided $30 billion to Israel over the past 10 years in announced aid only another billion plus is in the pipeline. Secret funding remains secret. I wonder @chrissy where are these protesting voices of tax payers on this dole out? let us see if our troll @John or whatever gets to have his day again courtesy CNN? Let the Arabs come to financial aid for Palestine, US obligation is to act as an honest broker to get the peace process going. aid to Israel in 2012 was 3 billion and beginning 2013 $3.15 billion per year. As for this Pal aid, it is nothing new it is what had been blocked by Congress because palestinians had decided to go to the UN for their rights. Now Israel has removed its objection to this aid to Palestine as Pr.Obama did not press them on freeze in expansion of settlements & peace process during his visit. As for Kerry's visit to Afghanistan, i have doubts whether there will be any change in the reality on the ground.